Rust stains on a porcelain or enameled cast iron sink, toilet, bathtub or shower pan are common occurrences. They can be caused when a metal object such as shaving cream can is left to sit wet on the surface, but can also be caused by galvanized steel plumbing pipes bleeding rust onto the surfaces, or because iron-rich hard water dries onto surfaces. The good news is that it’s possible to remove bathroom rust stains without a significant amount of time and effort. For the best results, ditch the bleach-based bathroom cleansers—these may actually worsen stubborn stains—and give one of these tried-and-true methods a go. Barkeeper’s Friend, in both powder and liquid forms, is an extraordinarily effective method for removing rust stains from bathroom fixtures. Barkeeper’s Friend will safely remove rust stains and mineral deposits from all toilet bowls and metallic faucet finishes. And, according to the manufacturer, it may also be used to remove stains from sinks, bathtubs and shower basins made of stainless steel, porcelain, Corian, fireclay, ceramic, acrylic, copper, glass, enameled cast iron, fiberglass, and solid-surface materials. According to the product's material safety data sheet, the ingredients in Barkeeper's Friend include mineral feldspar, sodium docecyl benzen sulfonate (a common detergent), and oxalic acid. Because it is much less abrasive than cleaners such as Ajax or Comet, Barkeeper's Friend is less likely to scratch surfaces. However, the main active ingredient, oxalic acid, can cause skin or eye irritation, so you should wear gloves and use this product carefully. Shaw’s Pads offer a chemical-free, septic tank-friendly approach to rust removal. Equipped with a simple handle and scouring cloth, Shaw’s Pads work on the “elbow grease” principal: Simply wet the pad and scrub stains away. Use Shaw Pads to remove toilet rings; rust, calcium and lime buildup; grey, green and brown water residue; algae and chemical stains on pool tiles; and hard water and well-water residues. Unlike pumice stone or abrasive cleaners, Shaw's Pads will not scratch any surface. They do, however, require a bit more effort in order to remove stubborn stains. Pumice scouring sticks work particularly well for removing rust stains from porcelain. Use Pumice sticks to gently scour away mineral deposits, rust, and other stains and scale from sinks, toilets, tubs and showers. They can be used them to remove rust and unwanted paint from metal work, piping, tile, masonry, and concrete, too. Made from 100 percent natural pumice, a soft volcanic stone, these sticks are safe for dermal contact and for use and storage around children and pets. ZUD cleanser is another product that employs oxalic acid and a potent combination of abrasives made up of finely ground quartz and pumice to zap rust stains on contact. Available in both liquid and powder form, ZUD dissolves rust, mineral stains, hard water deposits, and soap scum. And, according to the manufacturer, it may be used to clean copper, brass, bronze, chromium, iron, pewter and stainless steel. Simply squirt or sprinkle ZUD directly onto rust stains and brush using a toilet cleaning brush or plastic scouring pad. Then, add water to ensure that the ZUD solution covers the entire area. Add more ZUD where solution is missing. After the solution has set for about 60 to 90 minutes, clean the area with the brush and rinse away the solution. Zud is a slightly more abrasive cleaner than Barkeeper's Friend, but is considerably gentler than Ajax or Comet. The chief active ingredient in The Works Limeosol is hydrochloric acid, which instantly removes rust, hard water stains, and mineral deposits from appliances, bathroom fixtures, cement, brick, vinyl, siding, fiberglass, PVC, and other materials on contact—no scrubbing required. The Works is tried and true: It’s been around for more than 50 years. And, despite the fact that it contains a dangerous chemical, it’s long been a celebrated favorite among homeowners and home service professionals alike. The Works Limeosol is not recommended for use with septic systems, as the chemical will interfere with the biological breakdown of wastes. Take precautions if you use LImeosol, as this is a caustic chemical that will sting and burn skin upon contact. Wear protective gloves, and ventilate the area when you are using the chemical. White vinegar and baking soda: spray white vinegar on the stain, sprinkle the area with baking soda, and scrub with a ball of crinkled up aluminum foil. This can work both on porcelain, as well as on stainless steel. Salt and lime: Sprinkle a small amount of salt on the rust stain, then squeeze lime juice over the stain until the salt is soaked. Let the mixture remain on the stain for 2 to 3 hours, then use the rind of the lime to remove the mixture. Baking soda and water: Sprinkle baking soda over the rust stain, then scrub it with a toothbrush dipped in water. When using on stainless steel, make sure to scrub in the same direction as the grain. Potato and dish soap: Cut a potato in half, dip the cut end into dish soap or baking soda, then scrub the stain. Periodically slice off the end of the potato for a fresh surface, and contunue to dip into soap and scrub. Install an iron filter or water softener. Because bathroom rust is often the result of iron-rich hard water, especially well water, installing an iron filter or water softener will go a long way in preventing future stains. Generally speaking, these filters are easy to install, though they can cost upwards of $600. Keep metal cans away from the bathtub and sink. When in contact with water, cans containing metal rings on their bottoms (e.g., shaving creams, air fresheners, hair sprays, cleansers, etc.) will quickly rust and stain bathroom surfaces. It’s best to store these items in a cabinet away from the bathtub and sink. Wipe down the bathtub and sink after each use. 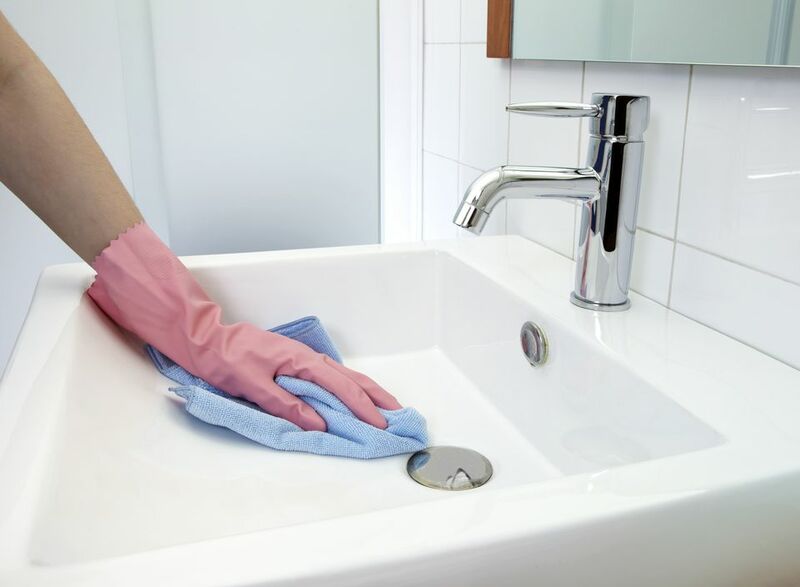 Rinse and wipe down the sink and bathtub after each use to remove any iron residue.